Kyle Mills is an American political and military thriller author who not only wrote his own books in the Mark Beamon series but also contributed to bestselling series like Vince Flynn‘s Mitch Rapp and Robert Ludlum’s Covert One after the authors passed away. While he hasn’t written books in his own series in a while, he is regularly keeping the Mitch Rapp series up to date. Here are the Kyle Mills books in order for his various series and standalone novels. The list is updated with new publications regularly. 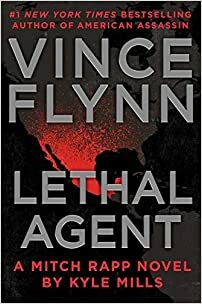 The original Mitch Rapp books by Vince Flynn are listed here. The Survivor picks up where Vince Flynn’s last book, The Last Man, left off. When Joseph “Rick” Rickman, ex-CIA star, stole sensitive information from the CIA, little did he know that he would end up dead soon. Mitch Rapp was sent after him, but sadly, getting rid of the traitor didn’t solve the problems. Because, he kept those stolen documents in a secret place, so now he can’t divulge their location anymore. When the Pakistanis are also after the forbidden secret documents, Mitch must do whatever he can to find them first before they will have dire consequences for the US. Order to Kill is a direct follow-up to The Survivor. This time, Mitch Rapp must go to Pakistan to find six A-bombs that were stolen from Pakistan. The bombs were stolen by a group working for the Russian president, Maxim Krupin, who wants to use them for his own benefit to cripple the competition. Also, the Russians are teaming up with ISIS, which makes things even more dangerous for the whole world. After Mitch, working together with Scott Coleman, gets ahold of one of those nukes, he learns something dire about that one nuke, something that gets him to infiltrate ISIS hoping to learn more. Mitch Rapp is still licking his wounds from his latest adventure, so he decides to take it easier for a bit. He doesn’t get a chance, though, because soon he hears about Saudi Prince Talal bin Musaid having been caught paying ISIS with a briefcase full of cash. The problem is that Saudi is an ally, and its leadership should never fall into the wrong hands. So Rapp is now sent in a secret and dangerous mission to exact revenge on the Saudi royal who has been siphoning money into ISIS. Mitch has to find the entire terrorist network and destroy it for good. But since Saudi is an ally, he has to do it in secret to avoid any diplomatic issues between the two countries. This story takes us to Russia, where the president, Maxim Krupin, has just found out that he has brain cancer, so now he is under treatment. While doing so, he is not very eager to relinquish his power. Anyone who tries to threaten him or mention about his illness is swiftly dealt with, and when his illness is becoming much more visible, he needs a serious diversion. A war with the West should do the trick nicely. So now Mitch and his friends, Grisha, and Scott Coleman, team up to go to Russia and get rid of a dangerous threat once and for all. But they must do it without being discovered because if the Russians find out what they are up to, a nuclear holocaust is not out of the question. A divided America is at the brink of new elections. All politicians can think about is keeping their powers intact. In the meantime, ISIS is hard at work. They have kidnapped a French microbiologist to work on creating anthrax. They are also recruiting Mexican drug cartels to help them smuggle the created bioweapon across the border. But as deadly as all this is, it’s just a major diversion to keep Mitch Rapp busy from their real goal: weaponize a deadly virus they found in Yemen. Now Mitch Rapp and his team of friends must infiltrate the Mexican cartels to find the ISIS leader whom he still has a beef with and to put him out of his misery once and for all. Kyle Mills was born in 1966 in the US. He grew up in Oregon, however, over the years, he traveled to many places around the country and the world due to the fact that his dad was an FBI agent who went on to become director of Interpol, so Kyle got to experience the life of an “army brat,” basically traveling wherever his dad’s job took them. The love for going after the bad guys was instilled in him from back then through his father’s job. Little did he know that, eventually, he would get to use that love for fighting terrorism through his books. In the late 1980s he graduated from college majoring in finance, and then he started working a 9-to-5 job in the corporate world. Initially, he thought that’s what he wanted, having a good, secure job, a home to settle down, a nice car, the whole works. Still, he was not happy with that lifestyle, so he began seeking out artistry in whichever way he could. He started taking rock climbing lessons, he met someone who equally loved climbing rocks, learning new languages like Spanish, and together they moved to Wyoming, where tall rocks to climb abounded. Kyle began working in Jackson Hole in a bank, while he would spend his afternoons working on his climbing skills. While he tried to do several creative works, it was his wife who suggested he starts writing a book. While he initially scoffed at the idea, eventually he did pick up a pen and paper, and almost one year later, his debut novel, Rising Phoenix was written, and just one year later it was also published, in 1997. Kyle Mills took over the Mitch Rapp series in 2013 after the bestselling author of the series, Vince Flynn, passed away. He also took over part of the Covert-One series started by Robert Ludlum, again after the author’s passing, this time along with authors such as Gayle Lynds, Patrick Larkin, James H. Cobb, and Jamie Freveletti. Currently, Kyle Mills is still living in Wyoming where he no longer climbs rocks due to arthritis; however, he replaced that past time with backcountry skiing and mountain bike racing. And, of course, he is working on his next book.